There’s no doubt about it, Martin Scorsese has clout. If he decides the national cinema of Poland deserves international attention, so be it, as he has proven with his touring retrospective “Masterpieces of Polish Cinema,” which premiered earlier this year at New York’s Lincoln Center and now arrives at Berkeley’s Pacific Film Archive (June 14-Aug. 21, 2014). In December 2011, at the invitation of Andrzej Wajda, Scorsese traveled to Poland to accept an honorary doctoral degree from The Polish National Film, Television, and Theatre School in Łódź. There, he met with Jędrzej Sabliński (a digital restoration expert, now with DI Factory), and reviewed a list of new digital restorations of Polish films. In the months following this visit, with the help of Scorsese’s non-profit organization The Film Foundation, the two men came up with the idea of a North American tour of a series of restored Polish cinema classics. From an extensive catalogue of digitally restored films, Scorsese chose 21 masterpieces; 13 of which will be featured in the PFA series. The series represents films from some of Poland’s most accomplished and lauded filmmakers, spanning the period from 1957–1987. Curated by Scorsese, each film has been digitally re-mastered and brilliantly restored on newly subtitled DCPs. Based on Count Jan Potocki’s early-19th-century novel, adapted by Tadeusz Kwiatkowski for Has’s three-hour extravaganza, Saragossa is set during the Napoleonic Wars and follows the exploits of a Belgian military officer who keeps getting waylaid by phantasmagoric adventures en route to Spain. Our protagonist, Capt. Alphonse van Worden (Zbigniew Cybulski, Poland’s “James Dean”) is introduced in the heat of a battle that suddenly swarms onto the screen, as throngs of combatants crowd the frame, seemingly out of nowhere. He takes refuge in a cabin where he becomes mysteriously drawn to a manuscript. With a flick of his sword, he turns a page and becomes fascinated with the manuscript’s fanciful illustrations, which become the iterated scenarios of the film. 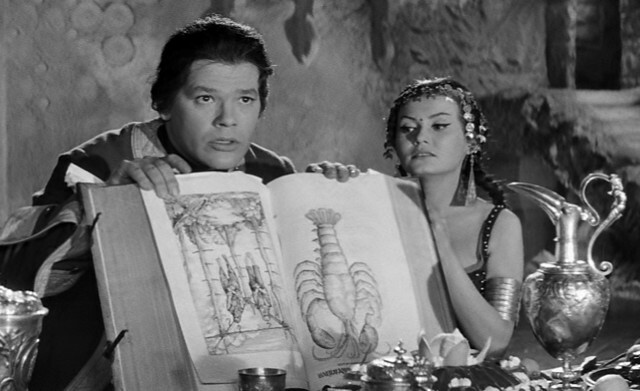 Saragossa ‘s literary allegiance can be considered either poignant (if quaint), or profoundly necessary at a time when contemporary audiences consider a film based on a comic book or a graphic novel to be a literary adaptation. 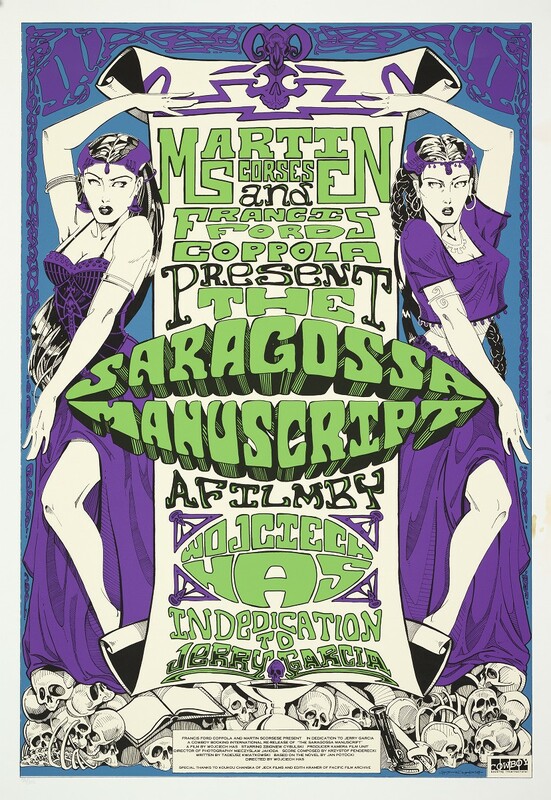 Saragossa is structured as a framed narrative, defined as a literary technique that sometimes serves as a companion piece to a story within a story, whereby an introductory or main narrative is presented, at least in part, for the purpose of setting the stage either for a more emphasized second narrative or for a set of shorter stories. The frame story leads readers from a first story into another, smaller one (or several ones) within it. Inarguably a head-scratcher, inscrutable and evasive by design, and deceitful by structure, Saragossa is a masterwork of nested narratives that thin the membrane between fantasy and reality as stories unfold within stories, realities capsize into dreams, dreams collapse into memories, narrators take center stage then recede, such that by film’s end—as J. Hoberman puts it—the rude awakening serves as the film’s running gag. But follow you will, even if you are confused, or unsure of where you are and what is really happening. Mieczyslaw Jahoda’s sumptuous black-and-white cinematography is meticulously framed. Famed composer Krzysztof Penderecki’s score appropriately unnerving. The scenarios are perplexing and macabre, the women are voluptuous, the corpses gruesome, and the unfolding structure of the film itself its own unique spectatorial pleasure. This entry was posted in Films and tagged Films, Martin Scorsese, Pacific Film Archive, Polish, Wojciech Has. Bookmark the permalink.